During the early decades of the 20th century education in the Northwest Territories was changing. 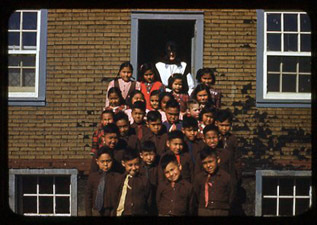 Early mission residential schools, established to help Aboriginal children in need, became schools for all Aboriginal children. Amendments to the Indian Act, enacted in 1894, made it compulsory for all Aboriginal children to attend school but it wasn’t until 1920 that penalties were imposed on parents who kept their children at home. By the early 1930s the RCMP had been given the responsibility of enforcing school attendance. Even under compulsory attendance, the year-to-year increase in the number of Aboriginal children in residential schools in the Northwest Territories was negligible. Many Aboriginal families still lived in remote hunting and fishing camps and only came into nearby communities a few times each year. But this was also a time when the economy of the north was changing, competition from white trappers and the prospect of wages from resource-based jobs made life in communities more appealing. As Aboriginal families began to move into communities, enforcement of compulsory school attendance became possible. For those communities without day schools Aboriginal children were sent to residential schools. While the education of northern Aboriginal children remained the responsibility of the Roman Catholic and Anglican run residential schools the type of education being offered in these schools began to change. The Federal Government was exercising more control over the curriculum and beginning to provide per capita funding for the often cash strapped residential school system. Emphasis began to shift from teaching simple reading, writing and arithmetic to agricultural and industrial training so that when young Aboriginal adults left school they had a better chance for wage employment. After the Second World War the pace of development in the north quickened substantially. The government conducted a number of major studies of the northern education system looking at how the system could be unified and how it could be made more responsive to the needs of Aboriginal children and families. In the late 1940s and early 1950 there were Roman Catholic and Anglican day and residential schools, mine company schools, Indian Affairs Branch schools, Northwest Territories Council schools, and, local schools under the control of school boards. In 1955 the Federal government began a process of consolidating the many different types of schools in the Northwest Territories and to come up with a system of new, and improved, residential schools.